In the previous post, we talked about openness. When you open yourself to the world, it's a life changing experience, but at the same time, you can potentially get yourself hurt emotionally or even become lost in the myriad of thoughts and words. 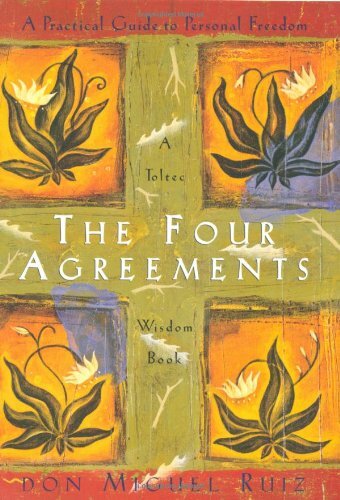 To help protect yourself and still be completely open both ways, you will need to make some agreements, specifically The Four Agreements by Don Miguel Ruiz [amazon] recommended by David Henke [linkedin] (a required read for his direct reports). This is a part of the Great Leadership blog series. Use positive and loving words that won't cause yourself or others emotional or mental harm. Regardless of what others (even yourself) say about you, don't take it personally / don't become hurt by the words as the problem is about the speaker and not you. Don't assume / infer what other people's words or actions mean, which leads to misunderstanding, but always ask to confirm. No matter what you do, always do your best. If you don't want to do your best, then find something else that you enjoy doing so you can do your best. When you do your best, that is when you can be happy. Using words is the most common form of communication, therefore it is crucial to master the use of words by fully understanding the meaning of words, learn how to use words in effective and good ways that don't cause harm to yourself and others, never let words harm you emotionally, and not misunderstand words by making assumptions. And of course, do your best to use those agreements whenever you open yourself to talk to or listen to others. As Don Miguel Ruiz says himself, and I concur, it is not easy to follow all four agreements, but with practice and time, you will be able to and become a happy and calm person always, which won't change regardless of what others say or do. Schedule: Make sure the timing works for both of you. If the other party is preoccupied, it is best to talk another time. Moderation: Like everything in life, moderation is key. If talking all the time, it means there is no time left to do other things. Talking too much can be exhausting, if not for you, for the other party. Also talking to too many people can be exhausting too. So pace yourself for the enjoyment of all parties. Audience: Ensure your talk is relevant and interesting to them. If they are not interested, which is their right, no matter how important or interesting the topic is to you, you should respect them by switching topic or find someone else to talk to. Communication is two ways involving multiple parties, so you have to think about interests from all parties. Also do take some caution based on who you talk to and what information is being shared - yes, there are bad people out there...well, misguided. Location: Relevancy also applies to where you are as well, so be mindful of your setting. If you are in a restaurant, you might not want to openly talk about something that may cause others to loose appetite. I have only briefly scratched the surface of the insightfulness and power of The Four Agreements by Don Miguel Ruiz. To have a better understanding of the four agreements, I highly recommend that you get a copy of the book -- it is a must read. It is crucial to accept and practice the four agreements daily before moving onto the next leadership trait, compassion, as that requires you to fully open yourself emotionally and yet still stay objective.